The Hiroshima International Film Festival 2015 just started today 20th Nov, it will be held on 4days until 23rd Nov. This festival was formerly known as Damah Film Festival during 2009 to 2013. From last year, the festival name has been changed to “Hiroshima International Film Festival”, which was reborn under the concept about showing positive film works from all over the world. The opening ceremony started 7pm at NTT CRED Hall in Pacela, Motomachi Hiroshima, full of people gathered to celebrate this newborn festival. The opening ceremony was started by observing a moment of silence for the terror victims in Paris on 13 Nov. Then Hidehiko Yuzaki of Hiroshima Prefectural Governor made a opening address. He said that he hoped this festival will grow as a cultural center in Hiroshima, and films and music is unable to exit without peace. Following his speech, Kazumi Matsui, Mayor of Hiroshima made a speech that he hopes Hiroshima will become the bridge for the peace between Japan and the rest of the world and expects this festival can contribute to it. After that, Kyoko Heya, HIFF President declared opening of the Hiroshima International Film Festival Then video messages were also introduced. In video, Francine Méoule of the Institut français du Japon – Kyushu delivered the heart warming message. The Ambassador of Japan to Portugal said it was grateful to have the Portugal films screened in Japan. 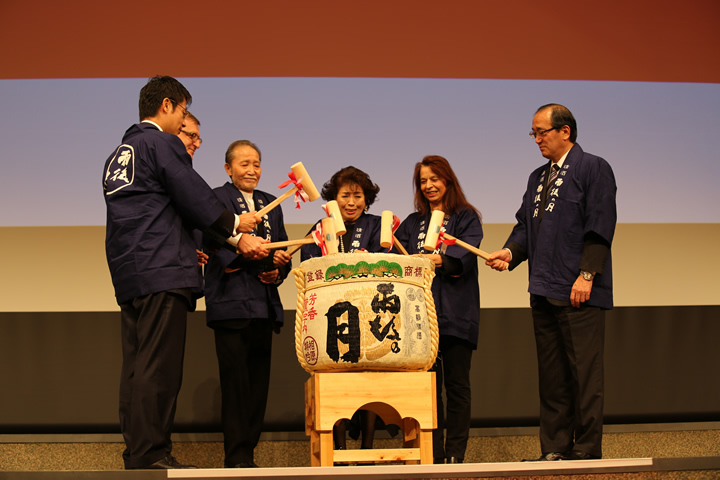 Finally, the second Hiroshima International Film Festival was kicked off with opening a ceremonial sake barrel with Hidehiko Yuzaki the Hiroshima Prefectural Governor, Kazumi Matsui the Hiroshima Mayor, Francine Méoule of the Institut français du Japon – Kyushu, Kiju Yoshida and Mariko Okada. This year’s highlight are “Arabian Nights” , directed by Miguel Gomes and Cinematheque Française program. Come and enjoy to watch the variety of movies from the world !